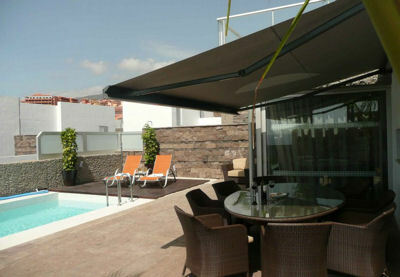 This modern four bedroom villa is located on the Habitats development in the Del Duque area of Tenerife. It is just a few minutes walk to the beach and the upmarket shopping centre, Plaza del Duque, where you will find designer boutiques, jewellery shops and restaurants. The villa enjoys splendid sea views and has air conditioning throughout. There is also wifi internet access. The villa is laid out over 3 levels. On the ground floor there is a spacious lounge and fully equipped kitchen. There are also two twin bedrooms and two bathrooms on this floor. Patio doors lead out to the sun terrace and private heated pool. There are plenty of sun loungers around the pool. The master bedroom, which has a king-size double bed, and ensuite bathroom can be found on the 1st floor which has its own balcony with patio table and chairs for enjoying a glass of wine. In the basement there is a further bedroom with king-size double bed, a laundry room and garage.